Hastings United's footballers will try again to continue their FA Trophy progress tonight (Wednesday). United will travel to fellow Ryman Football League Division One South side South Park in a second round qualifying replay. Kick-off is 7.45pm. The original meeting at The Pilot Field on Saturday ended in a 1-1 draw. 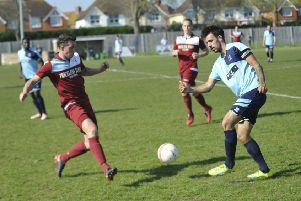 Frannie Collin gave United a half time lead, but Reigate-based South Park equalised after the break and survived the final half-an-hour with 10 men. United lost striker Jack Harris and midfielder Simon Johnson through injury during Saturday's game, and with Sam Cole and Stephen Butcher already sidelined, manager Darren Hare's squad is being stretched to the limit. United are aiming to win three FA Trophy ties in the same season for the first time in almost a quarter-of-a-century. The last time they achieved the feat was back in the 1992/93 season when the club was known as Hastings Town. At stake for the winners tonight is a trip to Oxford City in third round qualifying on Saturday November 26. Oxford are 17th in National League South, which is two levels above where United and South Park play.